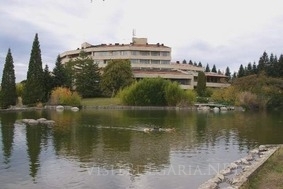 St. Vrach Complex in polenitsa village, near Sandanski spa resort in Bulgaria. Location: Hotel Complex St. Vrach is situated in Sandanski municipality along the middle flow of the Struma river and the western slopes of the Slavianka mountain. St Vrach complex is situated just 3 km away from Sandanski spa resort on a total area of 720 decares. The complex is an ex government residence and is now transformed into a hotel. The hotel is surrounded by a beautiful park and an unique botanic garden with over 200 rare plant species and an artificial lake amidst clam and tranquil atmosphere. The close vicinity of the complex to the mineral water springs in Skandanski is of great importance for the hot mineral water that supplies every single room in the complex. The mineral water in Sandanski helps the treatment of locomotive system diseases, diseases of the peripheral nerve system, the respiratory system, skin-allergic diseases and etc. Accommodation: St. Vrach is a three star complex offering – 7 double rooms and 10 standard apartments, 2 vice presidential apartments and 1 presidential apartment (650 square metres). Each room offers individual bath tub, AC, cable TV, mini bar, terrace with panoramic view towards the park and Sandanski. Conference centre: St. Vrach hotel offers 2 conference halls with a capacity 30-60 guests. Wine and dine: St. Vrach complex offers and excellent restaurant for 90 guests, serving delicious local and international dishes. The hotel also offers a day bar for 40 guests, poll bar for 30 guests. Spa & Wellness: The spa centre of the complex offers contemporary beauty procedures and special care for your body and soul.